From Baraga to Marquette, on US Highway 41, you travel away from the lake. Canyon Falls on the Sturgeon River is a few miles south of the town of Alberta. Look for the rest stop west of the highway. Shortly after the falls, Highway 41 intersects with Michigan 28, and then turns east towards Marquette. Along this stretch, you pass Craig Lake State Park - a nice little quartet of canoeing-only lakes with a 2 rustic back-country cabins for rent - and Lake Michigamme, a large reservoir lake with a reputation for good walleye fishing. The village of Michigamme, on the west end of the lake, has some charm and history to it - worth a stop. Van Riper State Park is on the east end of Michigamme and is a full service family oriented campground. There are a few miles of hiking trails; those along the river are the most scenic. In the summer of 2004, due to dallying too long in the Marquette area, we made an unscheduled overnight stay at a private campground on the north shore of the lake - Michigamme Shores. We found their accomodations and camp layout up to snuff! We stayed at Baraga State Park, which is adjacent to US Highway 41 south of town. 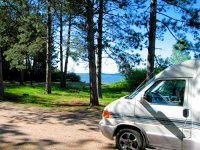 The park overlooks the lake and is an ideal campsite for the traveler who is just passing through the area or to use as a base camp for exploring attractions in Baraga County.The state park is on a flat plane and open landscape with little natural screening between sites. It only has one modest hiking trail and a small playground and a picnic area by the lake. It does have showers and electric sites and a dump station for RV campers. The price was quite fair. Baraga County is largely occupied by Copper Country State Forest and includes a number of mountains, streams, lakes and water falls providing lots of hiking and backcountry exploring opportunities. Some rainy weather prevented us from taking in as many waterfall hikes as we would have liked, but we did get to see 3 of them. < < < Canyon Falls is a 10-15 minute hike from the Canyon Falls wayside picnic area off US Highway 41 about 10 miles south of Baraga. The rapids below the falls and the canyon itself are also impressive. One map shows another falls downstream from here, but I didn't notice a trail to it. < < < Silver River Falls is off Skanee Road, east of the community of Zeba. There are several other falls in the area we look forward to finding and exploring in the future. 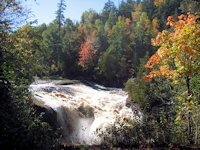 Among them are Sturgeon Falls, Tibbets Falls and the falls and hiking around Big Eric's Bridge. In addition to Baraga State park, L'Anse township has a 30 unit campground across the bay from Baraga. East and north of L'Anse, at the end of Skanee Road, is a rustic state forest campground at Big Eric's Bridge and Falls. A privately operated campground, Witz Marina and campground, is also on Skanee Road. On the other side of the bay, north of Baraga along US 41 is another private campground - Ojibwa Campground, with 50 units. Leaving Baraga, US Highway 41 takes you south and by Canyon Falls (pictured previously above). After the turnoff to Covington the highway turns east. About 8 miles there is supposed to be a wayside with a hiking trail to Tioga Falls. We keep missing this one! The next point of interest is the village of Michigamme. * Go here for a listing of more Quilt Shops around Lake Superior. A few miles before Michigamme Village, there's a state forest compground on Beaufort Lake. On the northern end of Lake Michigamme is a private campground we found satisfactory and reasonably priced: Michigamme Shores. On the eastern end is Van Riper State Park - popular with families and fisherman. There's not much for camping between Van Riper and Marquette - nor in Marquette itself. However, lots of good hotel-motel choices - beginning at Ishpeming and continuing to Marquette. For traveling campers, this is a good opportunity to enjoy the comforts and conveniences of a motel stay. As you approach Marquette on US 41 you'll go through Ishpeming and Nauganee. Two attractions here are of note. The famous Da Yoopers Tourist Trap and The Iron Industry History Museum. US Highway 41 north of Baraga runs adjacent to the lake with some nice views. As it gets closer to Houghton, it runs along Portage Lake-Portage River which bisects the Keweenaw Peninsula - essentially making it an island. In the past we've been too anxious to get to Copper Harbor and zipped through Houghton-Hancock, but since we've had time to enjoy the area. 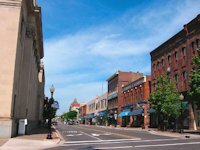 History buffs will enjoy spending some time in the area. As far as camping in the area, we have stayed at the Lake Linden Township park (north of Hancock on Highway 26). Reasonable price, spacious site. We've also stayed FJ McLain State Park - west of Hancock and the city of Houghton RV Park. Both are excellent choices. If you elect to bypass the Keweenaw, you take Michigan 38 from Baraga. Good road, forest landscape, not much of interest along the route, nor much for camping. 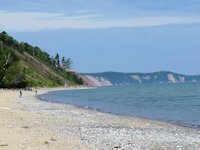 At the intersection with Michigan 26, you can go south to the village of Rockland and then take a side trip to Historic Victoria, before continuing on to Ontonagon. But if you are in a hurry, just stay on Highway 38 till Ontonagon. 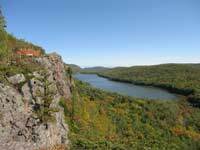 Then head west along Lake Superior to Silver City and the Porcupine Mountains. See the Porcupine Mountains, one of the upper midwest's best hiking and wilderness camping destinations. Houghton Michigan's unique aerial lift bridge.